Sipsey Street Irregulars: Anniversary of Trafalgar. "Trafalgar - 210 years ago, today (21 October, 1805) - When ships were of wood and sail, and men were iron. Trafalgar, one of the singularly most decisive naval battles in Western history, eliminated Napoleon Bonaparte's planned invasion of England." That reminded me of someone's observation that no English-speaking navy has ever been defeated by a non-English speaking navy. 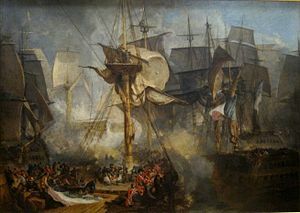 It is worth noting that the victory at Trafalgar owed nothing to any superiority of English ship design (or numbers) and everything to the superior discipline and training of English crews (including the option of dividing the English fleet into perpendicular lines to ensure opportunities for 'raking' fire against every ship in the opposing fleet, effectively tripling the effect of English gunnery). Without the edge in training, maintaining a coherent operation would have been impossible, and the exploitation of opportunities for raking fire would have been far less effective (raking shots must be made against a smaller target profile and without much benefit from prior 'ranging' shots, requiring highly trained gunnery). Had English crews (both officers and enlisted) not been categorically superior to their opponents in training and discipline, Trafalgar could only have resulted in a costly loss for the English (and a catastrophic loss given Nelson's division of his line of battle). Instead it was a resounding victory both because of superior English crews and Nelson's understanding of how to best utilize that superiority. Wooden ships and iron men. A lesson for all military efforts to come. Uh, Anon 6:15, then what would you call Pearl Harbor? "Please, Dear Leader -- Ban Firearms By Decree." Forwarded by a friend from a local firearm blog. Pity the poor gun cop bureaucrat. Rough night and another morning on the run. Keep Mexico and her people in your prayers. Why I was AWOL yesterday. David Codrea on the NRA and Open Secrets. Sorry, no posts this morning. "God, guns and keeping Christians safe." Anniversary of the M-1 Garand. So now there's an AK shortage? Off to early services at church. Want more gun control? Sit down and shut up. Digging her electoral grave with her mouth.